The leaders of the Educator Walkout (Red for Ed and the Arizona Education Association) signaled that the teachers and support staff would return to the classroom on Thursday if the Governor signs a budget that provides a raise to teachers and monies to go towards support staff and other urgent school needs. 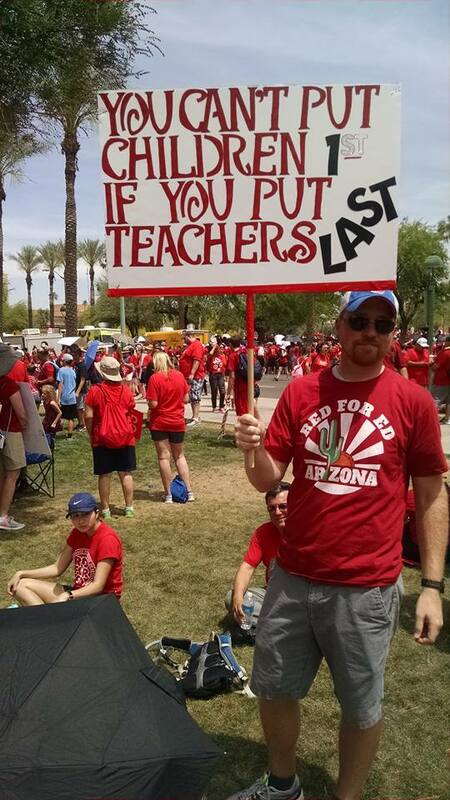 Is this the perfect solution to Arizona’s school funding woes? No, this is simply a down payment on solving the needs our Public Schools have in providing a first-rate quality education to the state’s children. With the closing on this chapter where the walkout brought the Governor and legislature to agree to a teacher raise and additional monies for schools, a new one will start to be written on Thursday as educators return to the classroom. There is a ballot initiative to fund education through taxing high-income earners that must be debated and voted on. There is an election in November where voters will have a chance to choose Progressive Candidates in a new Superintendent for Public Instruction, a new Governor, and many new legislators. If chosen by the people, these public servants will continue what started this last week and fully funding our schools by following the ballot initiative, closing corporate tax loopholes, or both. They will chart a new course to take our schools into the Twenty-First Century where our students are actively engaged and challenged in safe and modern buildings with educators who are well compensated. These future opportunities for the children and their schools are in the next chapter that still needs to be written. It can not happen without the people banding together to help to write it so please remember to participate, engage in the process, and vote this November. Nothing can happen without you. Next articleIt looks like the First Chapter in Increasing Education Funding is not quite finished yet.